Human Nature dealers call first dibs at new products launch on November 10, 2018 and major discounts! Human Nature Dealers call first dibs on new products and major discounts at our launch on November 10! View schedules here. Bring a friend and shop gifts of goodness together at our new products launch! 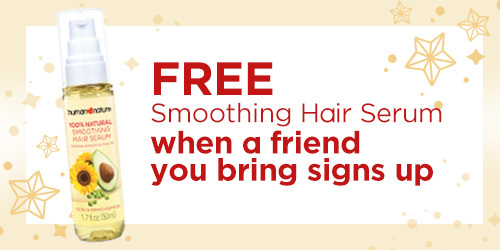 Get a FREE Smoothing Hair Serum for every friend you bring that signs up as a Human Nature Dealer. * The upline or referrer should be with the new downline during registration. * Recruit must successfully register as a dealer, and must purchase a dealer registration kit. * Recruit must be new and must have no existing dealer account. * Recruit must declare upline in his/her registration form. * Referrer must be present with the recruit at the time of registration to qualify for the freebie. 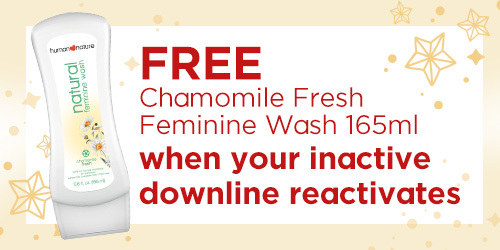 Get a FREE Chamomile Fresh Feminine Wash 165ml for every inactive downline that reactivates their Human Nature Membership. This offer is available for one day only so encourage as many inactive downlines to reactivate at our New Products Launch! * A downline must have an inactive status. * The inactive downline must reactivate successfully according to Human Nature's Membership Terms on Reactivation. * The inactive downline may activate at his/her nearest branch, and there's no need to be accompanied by the upline dealer. * The upline can claim the freebie at any Human Nature branch of their choice. 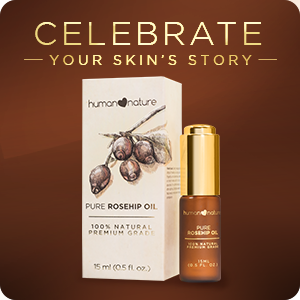 Enjoy up to 27.5% and 30% discount on Human Nature's new product this March! Get 27.5% off on new product for purchases below P3,000, or enjoy as much as 30% off on new product when you buy worth P3,000 and above. * Offer is not valid for products from partner social enterprises. 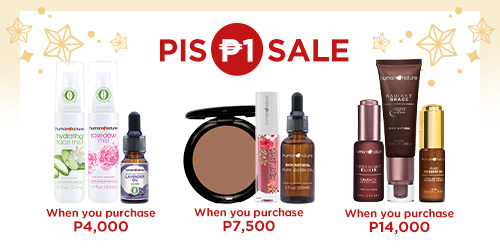 Get any of the following items for only P1 when you spend P4,000 on Human Nature products! Get any of the following items for only P1 when you spend P7,500 on Human Nature products! Get the following item for only P1 when you spend P14,000 on Human Nature products! * A customer can only avail a participating Piso Sale product under the threshold determined by the total amount of his or her purchase. As such, a customer can only get a freebie determined by the P4,000 threshold, P7,500 and P14,000. However, a customer who accumulates a total purchase amount of P11,500 can get a freebie under P4,000 and one P7,500 and so on. * Offer is valid for single-receipt purchases only. * Offer is valid on November 10, 2018 only for advocates and registered shoppers who attend one New Product Launch session. * Returns on any of the purchases shall void claim of the free product, and the corresponding amount of the products shall be paid by the customer. * Accumulation of P4,000, P7,500 and P14,000 worth of products is exclusive to Human Nature products and not valid for products from partner social enterprises.